Meet the funniest collection of characters ever known to mankind in this stupendously hilarious book that will make you laugh your socks off, and quite possibly your ears too. Winner of the Great Kerfuffle Best Book of Last Tuesday Hey you! No, not you - the person behind you. No, not him either. Left a bit, left a bit more ...You! Oh for goodness sake ...never mind ...Dear Everyone (including you!)! Welcome to the world of Great Kerfuffle! It's really great. And there's usually a kerfuffle (the clue's in the name really). Come and join our intrepid heroes Stinkbomb and Ketchup-Face as they set off on a highly dangerous and nail-biting adventure (or it may just be very silly and mildly perilous!). 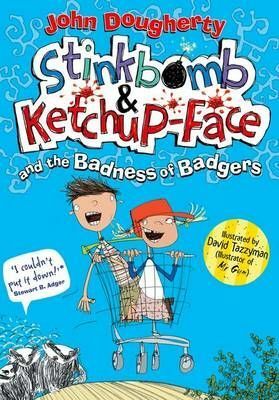 Oh, and there might be a few dodgy badgers hanging about too ...Meet the funniest collection of characters ever known to mankind in this stupendously hilarious book that will make you laugh your socks off, and quite possibly your ears too.